Imagine saying “I Do” in a beautiful bell tower with a huge lead light arch window under the ancient oak tree. Following the ceremony enjoy an afternoon with your guests in a private garden courtyard with games, vintage caravan bar, love shack and more. Hop on the old Bedford truck and be driven to the orchard for a bridal party picnic, stroll in the wild flower meadow before entering the beautiful historic dance hall which features big burgundy church doors, hardwood trestle style tables and vintage gold wooden tiffany chairs, sapphire diamond window feature wall, vintage pendant lighting and a vintage stage with plush velvet curtain and marquee lighting. It also includes beautiful indoor ceremony options. Your BYO drinks are chilled and professionally served by experienced staff from the old dance hall bar which retains its vintage charm but has all the mod con’s with modern bar fridges that are frosty cold. Stylish renovated men’s and ladies bathrooms and air conditioning all within the building. Tell us you saw us on WedShed, book your golden glow wedding at The Hall and get Lewis The Vagabond Vintage Caravan Bar and Ivy Vintage Grazing Caravan. Eugene & Joanna O’Reilly discovered The Hall in an abandoned state and although many thought they were mad, they set about saving her and getting the required council consents to be able to host weddings. Eugene has been the leader of popular wedding band Five O’Clock Shadow and has coordinated many many wedding ceremonies and rocked the party over many years. Joanna has won awards for her design work and her flare is evident in the design features around The Hall. She has a vast collection of interesting and unique props and has also been involved in the wedding industry for many years. Together they make a young passionate team that are willing to offer their wealth of experience, help co-ordinate and create a wedding unique to you. 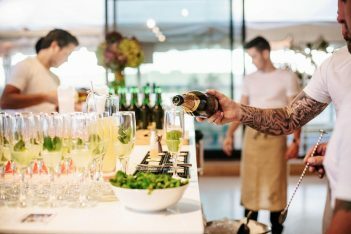 Award winning caterers, Eaton Drink Co. specialise in tailor-made menu creation and custom designed cocktails, we are modern and seasonal but ultimately we make food that tastes great.